Since Alexander Hamilton and James Madison first made their arguments for apportioning representation the United States has held 23 censuses. The 24th, the 2020 Census, will allocate members of Congress (and votes in the Electoral College) from 2022 through 2030. 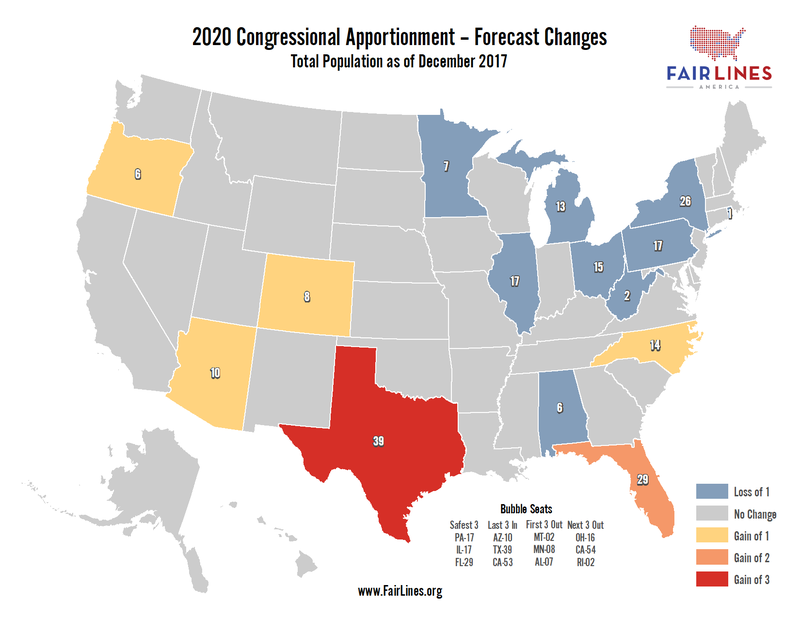 By taking the annual estimates of the resident population of the United States from the Census Bureau and adding a weighted average growth rate, Fair Lines America has produced a reasonable forecast for what the next reapportionment will look like. The Upper Midwest and Northeast are expected to see continued migration of representation to the South and West. Texas looks to gain its 6th, 7th, and 8th new members this century as Florida picks up its 5th and 6th. Three western states (Arizona, Colorado, and Oregon) would expand their delegations while North Carolina may gain the 14th seat it just missed in 2010. Illinois, Michigan, New York, Ohio, and Pennsylvania all appear likely to lose another seat, bringing their collective loss for the century to 19. Rhode Island is poised to join the ranks of At-Large states. West Virginia would replace Rhode Island as one of five states with only two members, and Minnesota could lose the 8th seat it managed to just barely hold on to in 2010. The 2010 decennial census found a 426,000-person population gap between the largest and smallest districts. If estimates hold, the next round of redistricting would see that gap grow to more than 500,000 people.